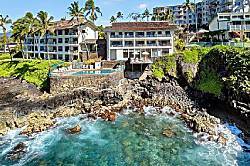 Poipu Shores is an oceanfront condominium complex about a 5 minute walk from Brennecke beach and 7 minutes to Poipu Beach park. 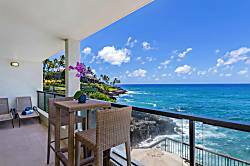 Most units at Poipu Shores are less than 100ft from the water with outstanding ocean views. 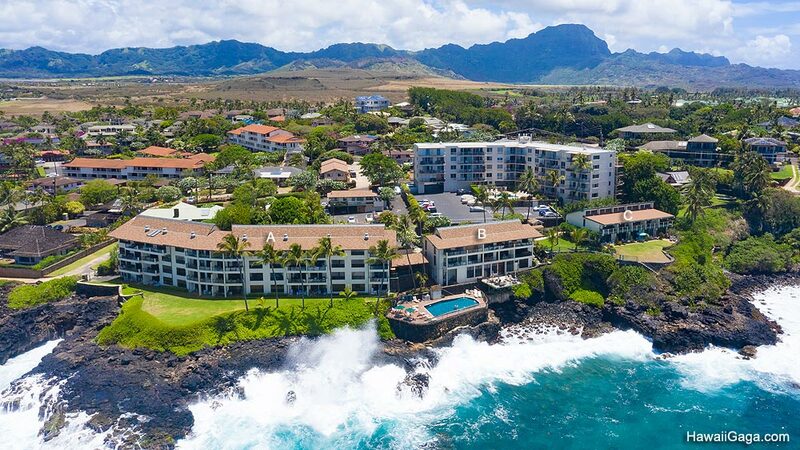 In fact the complex boasts some of the best views on the south shore with the condos built on an outcropping looking down Poipu's coast. A swimming pool hovers above the edge of the ocean. 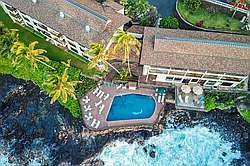 In the summer, when the south shore experiences bigger surf, waves create a dramatic effect as they splash against the lava rocks beside the condo. In the virtual tour below you'll see the splashing waves are visible from the inside of ground floor units (see unit 106A and 104A tours)! This is true of all building A's ground floor units. In the winter, whales are often seen along this section of the coast. Also within walking distance is Shipwreck beach and the restaurants of the Grand Hyatt. 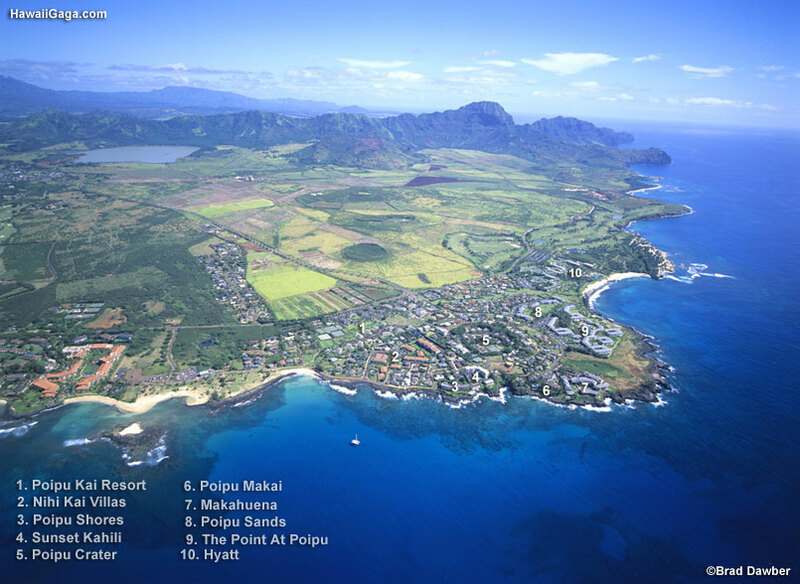 Units at Poipu Shores range in size from 912-1035 sq ft (building A), 630-1041 sq ft (building B) and 1200 sq ft (building C). Email us if you'd like to know the exact size of a particular unit. Oceanfront elegance. 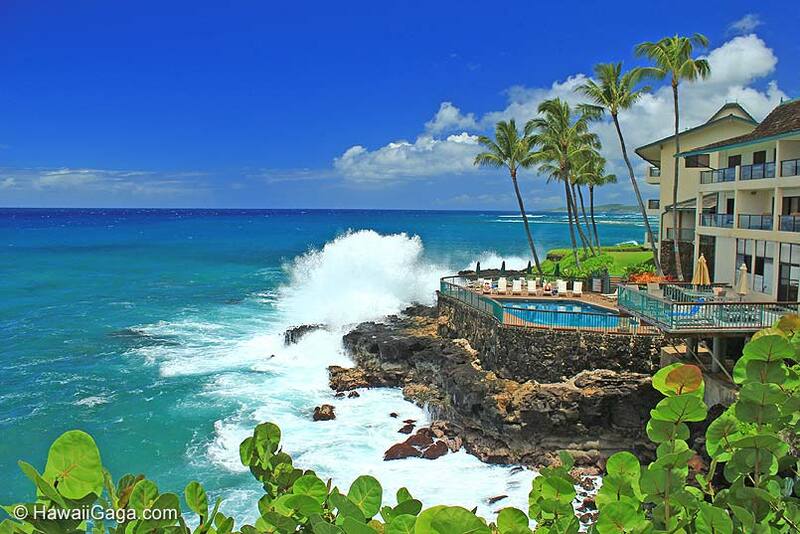 Gracious island living in this luxurious and exquisitely updated and upgraded oceanfront home. 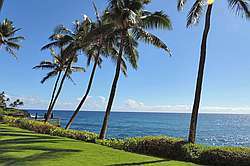 Spellbinding views of ocean and swaying palms frame your haven at Poipu. 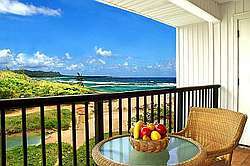 Poipu Shores 201A is a beautiful Hawaiiana style two bedroom condo that features an oceanfront master suite. 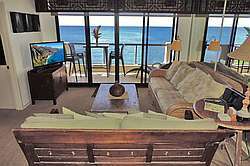 Dramatic ambience and upgraded deluxed oceanfront condo at Poipu Shores with stunning views. 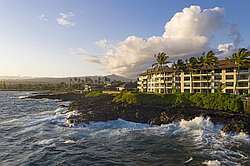 Dramatic oceanfront one bedroom unit at Poipu Shores with AC. 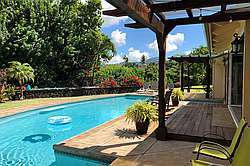 This truly special condo was completely remodeled and refurnished in May 2012. 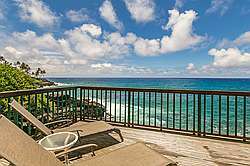 Perched above the ocean in 3BR Tropical Splendor! 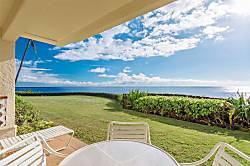 HUGE Seaside Lanai. Top Floor! Sunsets, Turtles, Chill. 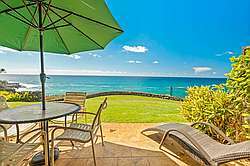 Poipu Shores Condo Unit 104C is a rare, fully oceanfront 2 story townhome, with two oceanfront lanais. This whole condo was recently upgraded and remodeled. 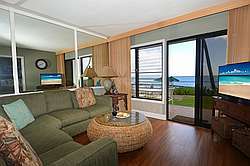 Showcase quality, designer-decorated two bedroom, oceanfront vacation condominium can accommodate up to 4 people. 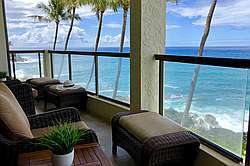 Stunning 180-degree coastline views from the lanai, the living areas, and the master suite. 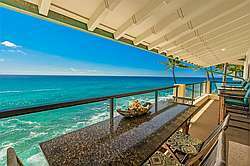 Hands down, one of the best views in Poipu from this remodeled 1035 sq. 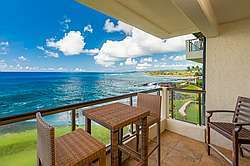 ft. penthouse unit at Poipu Shores! You cannot get any closer to the ocean than in this beautiful 630 sq. ft. condo. 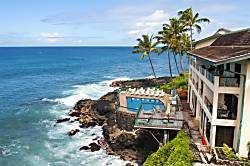 It comes fully equipped with gorgeous ocean views, spectacular sunsets and a turtle filled cove. Ocean front condo with a/c in master bedroom. Heated ocean front swimming pool. 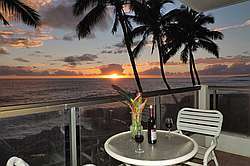 Escape to this very peaceful and luxurious 2 BR/2BA oceanfront condo located at the water's edge. 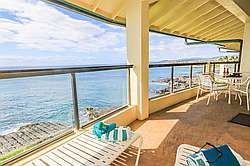 Don’t just vacation in Hawaii, live in total luxury at Poipu Shores 101C with central air conditioning and porcelain wood plank tile throughout! This beautiful townhome is located on the end with water views on two sides. 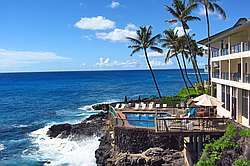 Kauai's best kept secret, stunning Poipu Shores 105C, is our Sea Cove Hideaway. This gorgeous unit has been recently remodeled and upgraded with attention to every detail and comfort. Granite countertops.